Shelf trucks and containers are widely used in the production process at mini bakeries, pelmeni and confectionery shops, drying cabinets. 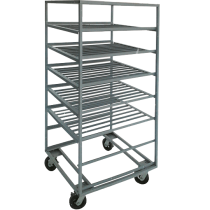 Shelf trucks and containers are designed for transportation and storage of finished and semi-finished products on wooden bread grates, cases for small goods and trays. In bakeries, containers are used for storing bakery products and for laying them out in shopping halla. Call us by phone and our manager will advise you on all issues related to shelf trucks and containers. LLC PKP "BAK" provides its customers with reviews from operating bakeries and bread-baking plants on the supplied bakery equipment. We guarantee the quality and reliability of shelf truck and containers by LLC PKP "BAK".